By the close of the Great War, death had become a constant companion for both military personnel and civilians alike, yet no one expected that long after the ceasing of hostilities, between 50 to 100 million people worldwide would be struck dead by a seemingly harmless strain of influenza. Yet, just as quickly as the Spanish Flu swept across the globe, it disappeared just as swiftly from both people’s memories and the annals of history. In fact, during much of the first wave and second wave of the flu (mid-to-late 1918), reports on the disease varied from confusion to indifference, and knowledge of how it spread (and from where), and how it could be treated or prevented were also muddled. According to Spanish and French publications the new disease called Spanish grippe, which appeared a few weeks ago in Madrid, has invaded Switzerland and is spreading rapidly. In Madrid alone there have been 100,000 cases and already nearly 1,000 persons have died. On July 9, there were said to be 6,800 cases in the Swiss Army. Although the grippal character of the disease has been recognized the causation is obscure. The absence of the influenza bacillus has been demonstrated. The onset of the disease is sudden with severe headache, high fever, throat irritations or slight bronchitis, a dry hacking cough, complete loss of appetite, muscular and articular pains, gastric disturbances and general debility. The disease attacks particularly men under forty years of age, fewer women than men, and children scarcely at all. The Spanish grippe, termed in Europe a mild form of cholera, has made its most notable impression at two distantly unrelated points, Berne in Switzerland, and Belfast in Ireland. It knocked out the Swiss army, seventy-five thousand men under arms all the time now, but changed every two months. Switzerland maintains the proper ratio for defense — ten per cent. From her four million population, she can at any time summon four hundred thousand men to arms. But she had no defenses for the Spanish grippe which broke out here July 20, and soon filled every hospital to the limit and also nineteen hundred graves. …In June and July there was slight comment in London upon a peculiar epidemic that would seize people so suddenly that, even at the theater, they had to be carried out. But there were few deaths from it, and if there were you would never hear of them in London. Yet there were no reports in the public press. Ordinarily such an epidemic would have made columns in the newspapers. But when France loses men by the hundred thousand and permits no report and Germany after five millions of casualties has closed her list to the public early in 1917, and British war casualties steadily average seven thousand per day, epidemics, whether of influenza or cholera, are outclassed. The antidote for Spanish influenza is said in France to be alcohol. By November, the Spanish Flu struck down nearly every village and town in Britain: in Sheffield, there were nearly 200 deaths a week; in London the death rate was 55.5 per 1,000; in Liverpool 215; and in Manchester, during the peak in the final week of November, the death rate was 46 per 1,000. Dr. James Niven, a Scottish physician and Manchester’s Medical Officer of Health, attempted to staunch the spread of Spanish flu in his city, and spread handbills and posters printed with advice on how to prevent and treat la grippe: avoid crowds, isolate oneself if one became ill, patients stay in bed, keep warm and call a doctor, discharges from mouth and nose should be destroyed, and those with even the mildest form of influenza should remain away from crowds for at least ten days. Unfortunately, when news of the armistice reached Manchester Tuesday evening, everyone swarmed the streets in celebration, and continued partying into the next day. By Wednesday evening, the Manchester Evening News reported that the death toll had risen to 149, and the following days found reports of Manchester’s alarming numbers of deaths from Spanish flu. Mothers and fathers were often stricken together. The children, themselves ill, could not receive attention, and for a time it seemed as if it would not be possible to get coffins for the dead, or gravediggers to dig the graves… Bodies were left as long as a fortnight unburied, partly at home, partly at mortuaries, and partly at the premises of undertakers. By the third wave of the flu (January-May 1919), authorities and health officials took the pandemic much more seriously, and medical specialists began to study the bacteria and its affects in order to understand just how and why the Spanish flu was so lethal. 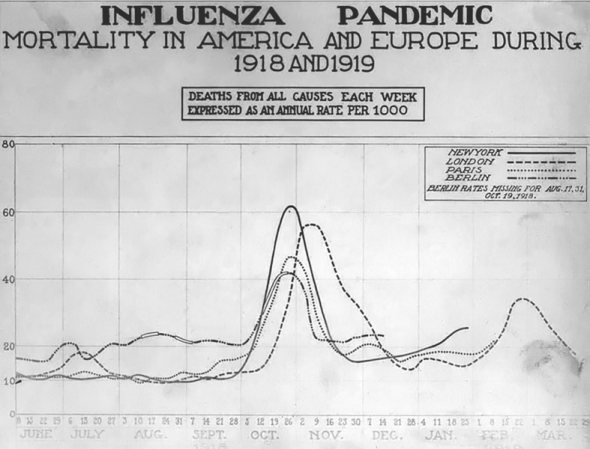 Questions that remained about the flu were why it affected the young and middle aged, whilst leaving the young and elderly relatively unscathed (however, Russia suffered from the reverse–children under 5 and adults over 65 were affected the worst), and why it virtually disappeared by autumn of 1919. Its cultural disappearance is also curious, as the letters collected by Richard Collier in The Plague of the Spanish Lady contain vivid and heartbreaking recollections from survivors of the pandemic–one would think that a disease that struck down so many and so quickly (and in America, shortened life expectancy by ten years! ), and occurred within the 20th century, would remain as prominent in the history books as the 14th century Black Death. Nevertheless, it stands as an appalling bookend to the modern era’s first deadly war, and after its prominent role on Downton Abbey, it should not be forgotten. Thanks for this — “Downton Abbey” was somewhat lacking in drama about the flu. I actually was sure they would kill off poor Lady Edith. Why are nursery rhymes always so morbid? That a world wide pandemic should strike in such a deadly fashion straight after WW1 surprises no one. Wars were always followed by famine and disease. But the flu largely affected the young and middle aged, whilst leaving the young and elderly relatively unscathed? That is the opposite of intuitive! When the AIDS epidemic struck in c1981, I bet our oldest citizens were saying “here we go again… another killer disease”. I asked my grandmother, now 100, whether she remembered the Influenza epidemic hitting their village in Italy. she didn’t seem to remember but when a visitor to the nursing home commented that she had heard Italians wore cloves of garlic around their necks to ward of disease, my grandmother replied that her Ma did. She said Ma was better than any doctor. Since my family all survived well into their 80s and 90s I’m going to take that as a true statement. It was such a terrible epidemic though. I have read a diary account of a young teenage girl and her younger sister in New England who had the ‘flu so badly they nearly died and one of an adult woman who had a mild case. How interesting about the garlic. Most of the books I’ve read on the subject have mentioned that the flu was such a confusing disease, everyone had their own notions of a remedy or ward against it. I still shudder in horror over one passage, which described rows and rows of dead American soldiers, who returned from France relatively unscathed, only to die from the flu. I don’t believe they have. Scientists have studied and isolated the disease, but they haven’t fully solved what makes it tick, so to speak.